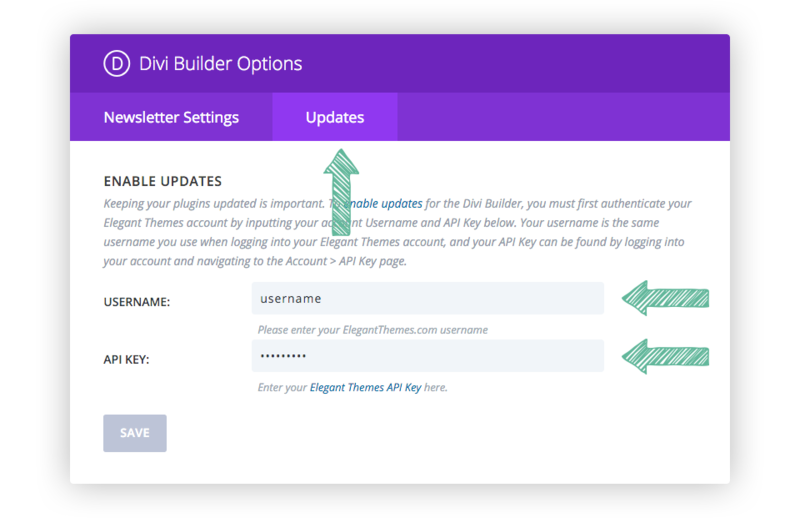 Using our Elegant Updater Plugin, you can update the Divi Builder right from your dashboard. When new updates become available for any of our themes or plugins, a notification will appear in the Dashboard > Updates page of your website’s WordPress Dashboard. Before you can update your theme or plugin, you must first authenticate your Elegant Themes subscription. Only members with active accounts have access to product updates. To authenticate your account, you will be asked to input two pieces of information into your theme or plugin settings panel: 1) Your Username and 2) Your API Key. Your username is the same username you use when logging in to your ElegantThemes.com account, and your API Key is a unique identifier used to authenticate your account that is only available to you when logging in. 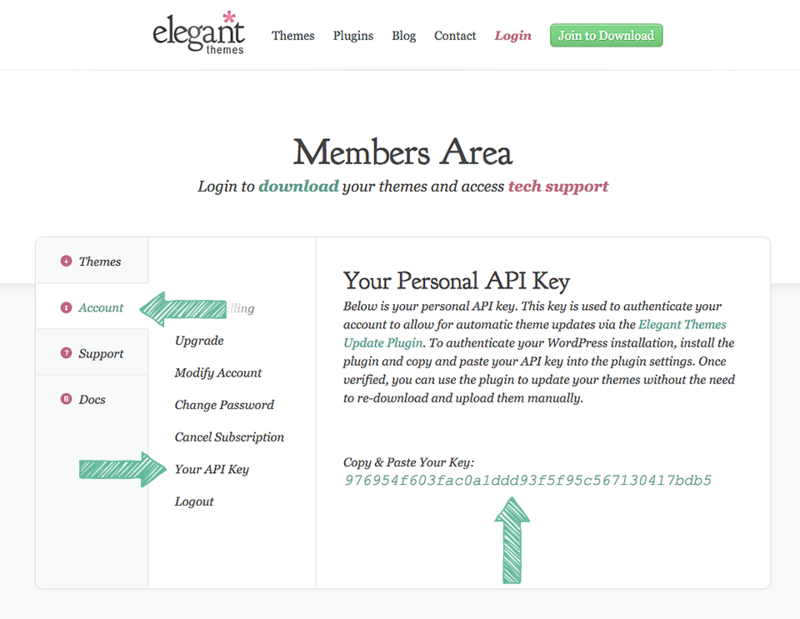 To locate your API Key, log in to the Elegant Themes members area and click on the Account > Your API Key link. Copy the API Key displayed on the page. You will by pasting this key into your Theme or Plugin options page. Once you have copied your API Key, you will need to use it to authenticate your account by pasting it into your theme or plugin options page. Log in to your website’s WordPress Dashboard and navigate to your theme or plugin options page. For Divi, this can be found by clicking the Divi > Plugin Options link. Once you have loaded your theme or plugin options page, look for the Updates tab. Click the Updates tab to reveal the Username and API Key fields. Type your username into the Username field and paste the API Key you copied earlier into the API Key field. You should confirm that you have not copied any extra white spaces by mistake. Click save to complete the account authorization. Once you have entered your credentials, you are now ready to update your plugin. Click on the Dashboard > Updates tab and update your theme or plugin normally using the WordPress update interface. If you do not see any update notifications, or you receive an authentication error when updating, try waiting a bit and then check back later. Sometimes WordPress will cache update notifications and it can take some time for them to appear correctly.